Warning: SPOILER alert! Proceed with caution as this post is full of… um, spoilers. Overall, we thought director Gary Ross did an excellent job staying true to Suzanne Collins’s character arcs as well as her vision of Panem. Big sigh of relief there. What was disappointing about the movie? Well, anytime an amazing novel is turned into a cinematic event, you’re going to lose scenes and details that you wish could be included. The Hunger Games is no different in this regard, though we thought the directors pretty much made the right choices in this arena (no pun intended). Interestingly enough, it was the first half of the movie—the parts that took place before anyone stepped into the arena itself—that were the most moving, heart-wrenching, and devastating. Long before the “Games” actually began, I was an emotional wreck. The ache in my chest started straight away as the cameras caught the poverty and oppression in District 12. As the producers cut back and forth between Seneca Crane/Caesar Flickerman discussing the games in sports-commentator fashion and the terrified children/families preparing for the reaping, I was unhinged by the cruelty of it all. The reaping scene itself was so well acted that viewers could have been right there in the square, holding their breath along with the other potential tributes. Katniss’s goodbyes, her journey to the capital, and her preparations for the Games (both physical and emotional) were all too real. Absolutely spot-on across the board. 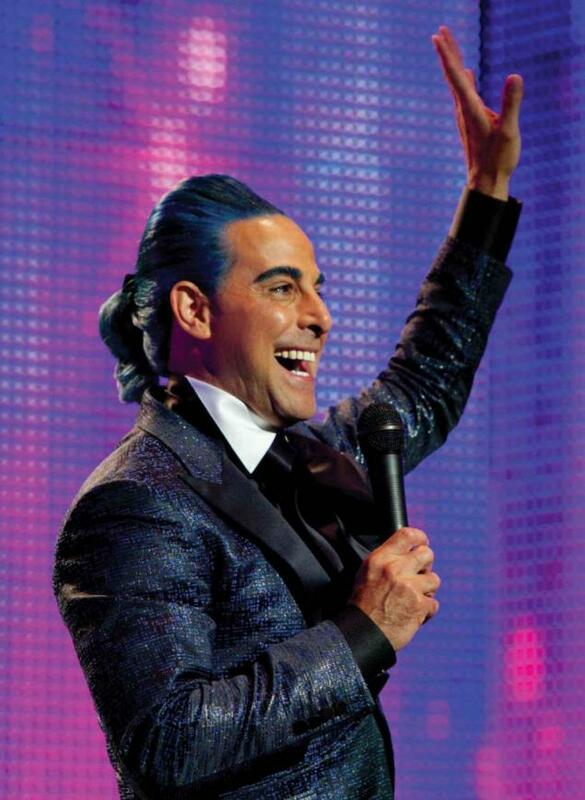 Elizabeth Banks and Stanley Tucci were both amazing in their respective roles as Effie Trinket and Caesar Flickerman. They couldn’t have been more on target (I swear, I’m not making up these puns on purpose). Haymitch. Must admit, I was a little skeptical about Woody Harrelson being cast in this role (mostly because I still picture him as the sweet-faced boy from Cheers). Boy, was I wrong. He was fantastic as a slightly nicer (and less inebriated) version of mentor Haymitch Abernathy. Josh Hutcherson (Peeta) and Liam Hemsworth (Gale) both nailed their roles as Katniss’s potential love interests. And Jennifer Lawrence as Katniss? Brilliant. Flawless. Stunning. Insert adoring adjective of choice. We expected some differences between the book and the movie, of course. Here are a few noteworthy moments. 1. Seneca Crane being locked in the room with a bowl of nightlock berries. Wow—not easy to make viewers feel sorry for THAT character, but somehow this move by the evil President Snow came pretty close. 2. Gale’s perspective while watching the Games. Loved this. It was subtle but so REAL and moving. 3. The uprising in District 11 after Rue’s death. Gave us all chills. 4. The way you could see the arena being manipulated in 3D by the Gamemakers. Creepy, sickening and thought-provoking. 1. The mutts were just mutts. No resemblance to the fallen tributes at all (though they were some seriously scary beasts). 2. Madge and the mayor. I can see why they cut these characters out, but I still missed them. 3. The avox girl Katniss met in the capitol (and the story of how she got there). 4. And of course, all the details and insights that are impossible to glean from a movie but that made the book so incredible and intense. Which begs the question: how does this movie hold up for viewers who didn’t read the books? This could go on forever. Bottom line—we were impressed by the adaptation. But we’d love to hear what YOU think, so drop us a silver parachute and let your voice be heard. And okay we can't stop thinking about The Hunger Games movie either. 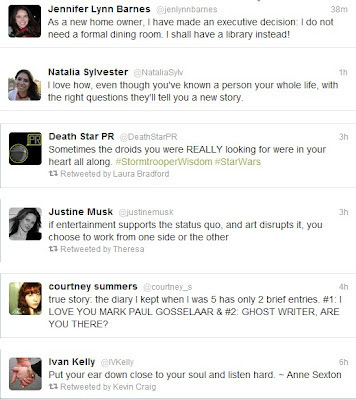 In fact, most tweets this week were all like "OMG this movie's awesome!" "Love J Law as Katniss!" "Dude, I cried during the first five minutes" "Rue was perfect and adorable and tragic" "Lenny Kravitz as Cinna is inspired"
Okay, truthfully those were the positive ones. And mainly the ones we agree with. But tune back on Thursday for more specific thoughts on the movie. Peace. All right, let's be honest. 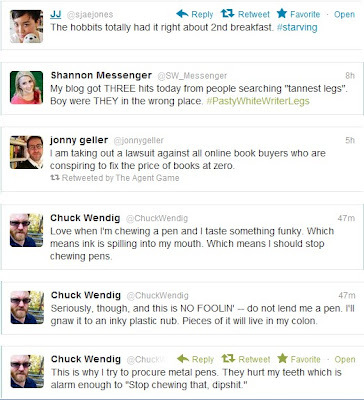 No one in the YA blogosphere is paying attention to blogs today. All we're doing is running around like chickens with our heads cut off, screaming, "HUNGER GAMES MOVIE HUNGER GAMES MOVIE HUNGER GAMES MOVIE!" If you've seen it, we'd love to know what you thought. Was Cinna as fabulous as in the books? Was Josh Hutcherson too short to play Peeta? Did Liam Henderson ever change his facial expression? How many tissues did you go through for Rue? For those of you who (like us) have not yet seen it, don't worry: it's not going anywhere. There is plenty of time to get to your nearest theater. In the meantime, here are some AWESOME movies you can look forward to -- we certainly are! -- with clips you can watch right on your computer. 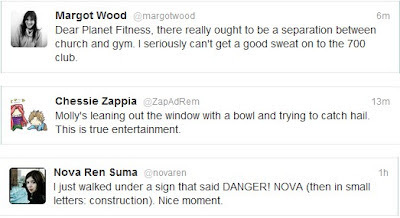 So, our twitter round-up this week is pretty slim. The vernal equinox is a busy time, and we're spending that time sucking the marrow out of life and living deliberately. It's exhausting. But Kate Hart is our hero--using her time all productively and stuff. Have you SEEN what's she's done with infographics?!? She's the Mac. Also, Margot Wood, the Real Fauxtographer herself, has a new series of photos inspired by YA novels. First up was The Forest of Hands and Teeth by Carrie Ryan. Next: Divergent by Veronica Roth. Then she posted this gorgeous photo inspired by The Daughter of Smoke and Bone by Laini Taylor. Keep up the inspiring work! Do you ever wonder what happens after the last page of a book? 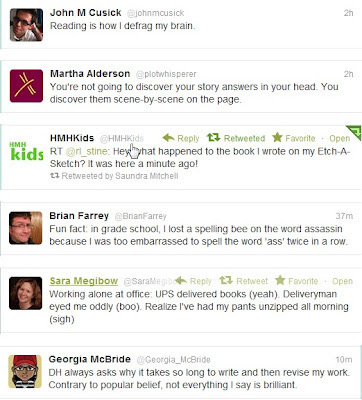 I often find myself wanting to know more about a story than just what the author tells me. Sometimes that information is available. 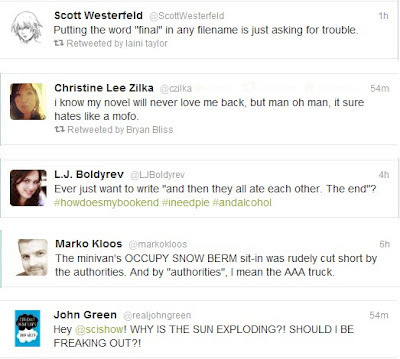 Some writers offer extras, deleted scenes, and additional back story. But does the author have the right to say what happens outside of what’s published on the page? 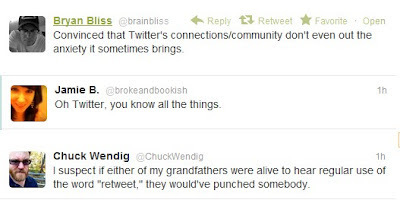 Personally, I like when an author knows more about the story than what’s on the page. It’s how writers like Tolkien achieved such a great illusion of depth. Kristan and I were discussing this on the way to a WHYA meeting and we came to the conclusion that everyone should have a choice. The author has the choice to offer extra information if they want to. And it’s our choice to listen to what they have to say or to rely completely on our own imaginations. What do you think? I'm going to get a little personal (eep, this idea sounded so much better at 2am). The biggest challenge in my life has been (still is) my weight. I used to be an average-sized kid until age ten when I ballooned. Despite playing sports (hockey), riding my bike for miles, climbing trees, hiking, canoeing, etc, I was put on one diet after another. I remember having to weigh out portions of food for myself and giving up pepperoni on my salad along with the zesty Italian dressing (tragic!). But mostly I remember the days after school where I would come home and eat an entire bag of Doritos. And nothing else. Food was the thing. I thought about food all the time. When I was twelve, I decided to sign up for Adventurer camp, which warned that I would have to walk a few miles each day to prepare for a twelve mile hike on the Appalachian Trail. In my imagination, I was ready. Then reality hit somewhere mile marker nine when I was pouring with sweat, my lungs were on fire, and I said to the nurse--who stayed back with me while the group buzzed by on the trail--"I can't do it." I did finish the twelve miles that day. Later the park rangers picked me up in a Jeep and took me back down the mountain. I was dehydrated and my legs were jelly. I couldn't stand up until somewhere around noon the next day. It was humiliating that my body didn't do what I thought in my mind that it was capable of doing. After that I let my mind and body live separate lives. They're much happier that way. No more arguments. No tears being shed or things said in the heat of the moment. It's amicable. 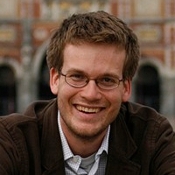 Of course there are always reminders of what I actually look like: When I see a picture of myself. When someone says, "You have such a pretty face." (I try not to think of the implication being that the rest of me is ugly...because I have some seriously cute toes). Each and every time someone asks me "Have you lost weight?" I always think, "Nope. You just remember me fatter." But here's the thing--at some point I found a way past my tragic flaw. Okay, I was built for farming, but I eat healthy now (have done for fifteen years). I could do better with the exercise (farming would help). I have a really beautiful family that loves me and a "Cameron Quick" who sees the real me and thinks I'm adorable--not my toes, though. We've agreed to disagree. I'm always going to struggle with my weight, try harder to lose, give up, try again, etc. But being fat is not everything there is about me. It's taken me a while to come to this conclusion. 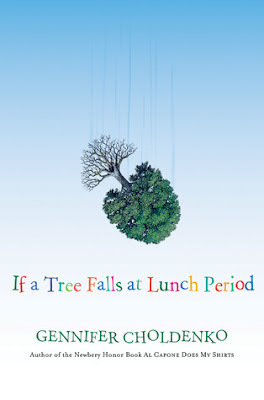 Recently, I read some books that I wish I had as a teenager. It would have made things so much easier. In SWEETHEARTS, Jennifer (Fattifer) actually invents a whole new persona for herself to escape her unhealthy past. She finds an "out" until Cameron Quick--the boy who knows her best and loves her anyway--comes back into her life. In IF A TREE FALLS..., Kirsten has put on thirty pounds in three months. Her parents are fighting all the time and she copes with food. Later, she sneaks into her garage to her mom's stash of junk food and overhears a conversation that changes everyone's lives. 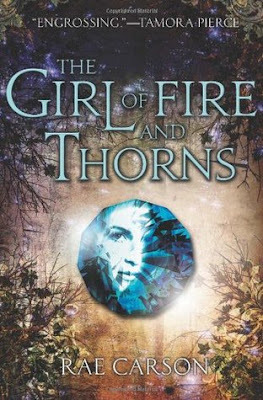 But let's not forget THE GIRL OF FIRE AND THORNS, (GOFAT) which also has a character who is lacking in self esteem, not realizing her importance, struggling to look past her weight problem, eats some really decadent food to cope...and after enormous trials has the strength to come into her own. All of these stories show the possibility for change and success. The main characters are seriously strong despite their weaknesses. Man, I needed this message at thirteen! As a fat girl, I'm thankful for these characters/stories. For seeing a way through. For self-acceptance. For perseverance. For Cameron Quick. Okay, being fat is not as tragic as losing your parents in a car crash or teen suicide or drug addiction or sparkly vampire love. But as a teen, it was everything I thought about. It was tragic enough to take up residence in my psyche and burrow in there until I made my mind and my body share custody. Sometimes divorce can be messy. But most of the time I don't like to involve mediation. My body accepts the limitations, and my mind lords it over. Aaaaaaaaaaaaand it's March. Just in case you missed that fact. 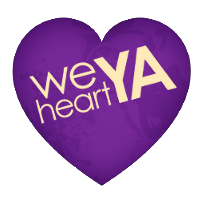 We're so helpful over here at We Heart YA. 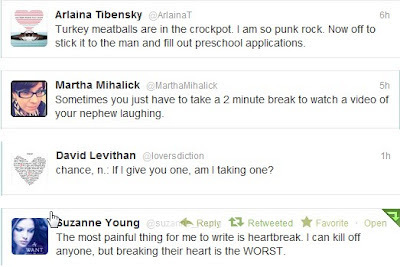 Bringing the info to ya... just like these, our favorite tweets from the past week. 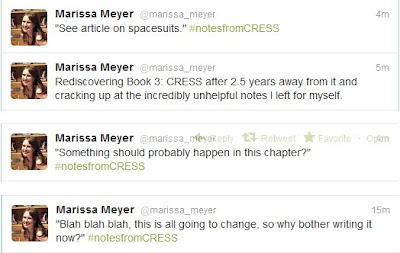 Best Hashtag of the Week goes to Cinder author Marissa Meyer with #notesfromCRESS. In case you haven't read any interviews or seen Marissa at a signing, she has her 4-book series already drafted. But everyone knows first drafts are shhhtricky. These are some of the notes she left behind for herself. 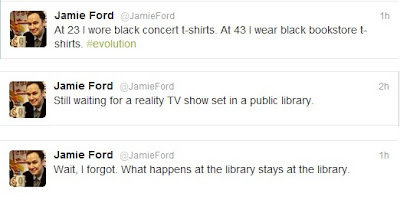 Jamie Ford (author of Hotel on the Corner of Bitter and Sweet) is always saying the best stuff. He's an honorary YA. So there's this other thing happening in March... What was it now??? 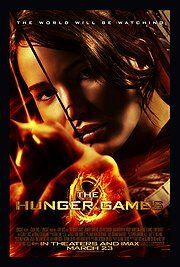 Oh yeah, THE HUNGER GAMES movie!!!!!!!!!!!!!!!!!!!!!!!!!!!!! In Love -- But Not With the Love Interest! Edward, Jacob, Peeta, Gale, Jace, Four, Etienne, Cricket. We know their names, we drool over their broody eyes and chiseled abs, we dream about being the object of their sweet, lavish affection. But recently I read a book that inspired a different kind of love: Sweethearts by Sara Zarr. Many readers will tell you that the hero, Cameron Quick, is perfect. He's tall, dark, and handsome -- plus mysterious and wounded, to boot. All the right ingredients, no? And yet the character I really fell in love with was Jenna Vaughn. 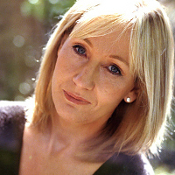 The heroine, in every sense of the word. Reading Jenna's story was like sitting atop a mountain to watch the sun set. You see the brilliant oranges and pinks as they melt into the horizon. You feel the wind turn cool against your bare skin. You hear the crickets begin to chirp in the woods behind you. And then suddenly you realize that the thing you were watching -- the sunset -- is long gone. And while you were so focused on its disappearance, the world became something else entirely. Something dark and magical, filled with twinkling stars and fireflies, and a great big moon beaming brightly overhead. That's what Jenna is: a quiet, beautiful surprise sneaking up on you, right in front of your face. Right in front of her own face, too. It amazed me how the author was able to reveal Jenna's true nature to me at the same gradual pace that Jenna realizes it herself. Tentative girlfriend, sympathetic stepdaughter, high school misfit, former fat kid. Jenna is so much more than the sum of her parts. She's so much more than she gives herself credit for. And she's what I want so much more of in YA fiction. Forget the boys. 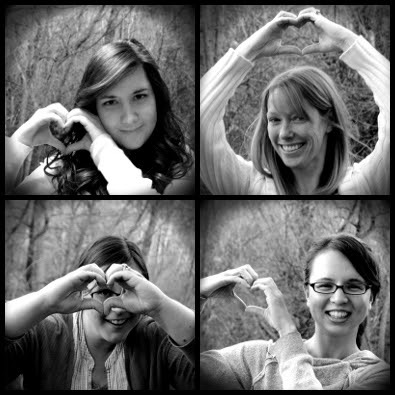 Give me clever, flawed, brave, vulnerable, passionate protagonists -- and I'll give you my heart every time. So tell me, who else should I fall in love with? Who are some of the non-love interests that have captivated you?